Ever accidentally tripped over a wrinkle in your carpet? *Raises hand in guilt* We don’t blame you. However, have you ever thought about actually removing said wrinkle so you no longer have to strategically avoid an entire section of carpet? You should! Wrinkles and bubbles in old or improperly installed carpet happen, it’s nothing to be ashamed of. Plus, it’s easily fixed by re-stretching the carpet. My Carpet is Not That Old, Why Does it Already Need Restretched? 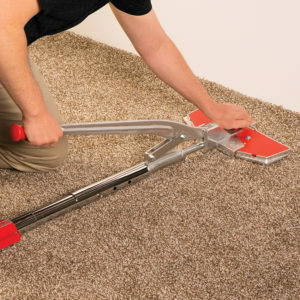 Carpet re-stretching is so common because many home builders and carpet retailers outsource installation. To be competitive, they want to keep the price low for this service. So, they give installers a limited amount of time to do an install. That means they just use the knee kicker to install carpet, which speeds up the process but lacks the quality. What you really want to install carpet is a “power stretcher”. This doesn’t actually use power, but it is a big lever that stretches the carpet from one side of the room to the other. Properly done, a carpet stretches 1-2% of its length. So, on an 18 foot room, that can be as much as 4 inches. No human can do that with a knee kicker. When not stretched properly, carpet will get bubbles and wrinkles over time. If you are looking for a reputable company to install your carpet properly the first time, we recommend Baldwin’s Flooring America. What is the Process for Restretching my Carpet? First and foremost, you have to remove any furniture that is on top of the carpet. The furniture has to be removed to do a proper carpet stretching because otherwise it interferes with getting the carpet really nice and tight. If you chose to work with Big Red’s Guaranteed Clean, we usually have a discount on furniture moving with carpet restretching. The carpet pad has a slick side and a sticky side. Properly installed, the sticky side is down and the seams are taped. The slick side allows the carpet to be stretched. We stretch the carpet from one tackless strip to another using our power stretcher to guarantee quality. Carpet re-stretching is less expensive over wood subfloors than it is when stretching over concrete. However, carpet restretching is still very affordable. Being able to properly re-stretch carpet can depend on where the carpet is located. It is not always possible, or cost effective, to re-stretch steps or hallways. Steps should have a tackless strip on the sides and at the back of every tread. When steps are installed with staples rather than tackless strip, the cost to repair them skyrockets and it may not be worth the price to re-work the steps and install them properly. Hallways can also be challenging because the doorway cutouts are already made. Any stretching to the length changes the alignment of the doorway cutouts and this often requires additional carpet to patch these areas. The most important fact is that re-stretching helps extend the life of a carpet. The more the carpet gives when it is stepped on, the less life the carpet has. Too much deflection will cause separation between the primary and secondary backings over time and the only remedy at that point is new carpet. So, keep it tight and make it last! In general, carpet only needs to be re-stretched once. Some older carpet backings would stretch over time and might need to be re-stretched multiple times, but that is rare. So get your carpet re-stretched now and stop trippin’! 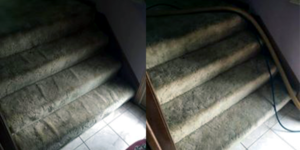 If you are interested in getting your carpet re-stretched in Omaha, or any other types of carpet repairs, contact Big Red’s Guaranteed Clean! We guarantee quality care and service!